The idea of a “company town” is somewhat of a bygone notion today, but that’s exactly how Kilauea got its start. Many of the old buildings you’ll see here were purpose-built to serve functions within the Kilauea Sugar Plantation or to answer a need of its employees. Looking back through history, it’s rather hard to point to an exact date when the area around Kilauea got tied to the sugar industry. Kilauea Sugar was incorporated in 1880, but the consolidation of its land by non-native owners had started 30 prior (with Mr. Charles Titcomb beginning a private sugar cane plantation in 1863). Since sugar cane grows naturally around the islands, Hawaii found itself poised for massive industrial-scale agriculture in the nineteenth century–all it needed was a market for its products and the enough hands to work the fields and mills. In 1876, the United States opened trade with Hawaii, creating the market. And about that same time, economic troubles in China and Portugal made moving to Hawaii an attractive proposition for adventurous workers. With all these pieces in place (and 300 shares sold at $1000 apiece), Kilauea Sugar Plantation got off to a fast start. Within a few short years, the plantation scooped up more and more land, built the island’s first railroad, and supported a large multinational body of workers. As with any company town, workers relied on the plantation to provide for many of their needs, including meals, shelter, and medical care. And for everything else, there was the company store. In Kilauea’s case, the name Lung has almost always been synonymous with retail. In 1902, the plantation rented one of their buildings on the current Kung Lung Market Center site to a Chinese businessman named Lung Wah Chee. Lung operated his business to meet a wide variety of needs to Kilauea’s workers. It was an all-in-one general merchandise store, barber shop, butcher shop, diner, and post office. In the 1940s, the original woodframe building was replaced by the stone building that stands today. And in 1955, the business was passed to Lung the original owner’s son, K.C. Lung. 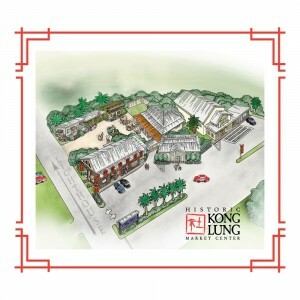 After the plantation processed its last harvest in the 1970s, the Kong Lung store continued its business in commercial retail. Today, it and many other buildings around Kilauea holds a place on the National Register of Historic Places for its painstaking restoration and its role in the town’s development.